Whisk together all dressing ingredients in a small bowl. Adjust for lemon. Set aside. Combine all chicken salad ingredients in a large bowl. Drizzle dressing over top and mix to combine. 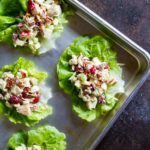 Serve over crisp butter lettuce. Store leftovers in fridge for up to 3 days. This recipe works great with any leftover chicken or rotisserie chicken. You can also cook up 2 boneless, skinless chicken breasts. My favorite way to cook chicken breasts to keep them nice and juicy: lightly pound chicken breast into one inch even pieces in between 2 pieces of parchment paper (I use my rolling pin.) Lightly salt and pepper each side. Heat 1 tablespoon of your fav cooking fat over medium heat. Place chicken breast into pan and cook for 6 minutes without moving it, until golden brown and easily lifts from pan. Add 1 teaspoon of butter, lifting chicken so the butter flows underneath. Cook for an additional minute. Flip chicken and cook for 5-7 minutes, until chicken is cooked all the way through. Remove pan from heat and allow chicken to rest for a couple of minutes.